Many first responders were on the scene Monday at a fatal traffic crash at the U.S. Route 62/SR 753 intersection. One man was killed and two local residents were critically injured, according to Fayette County Sheriff Vernon Stanforth. 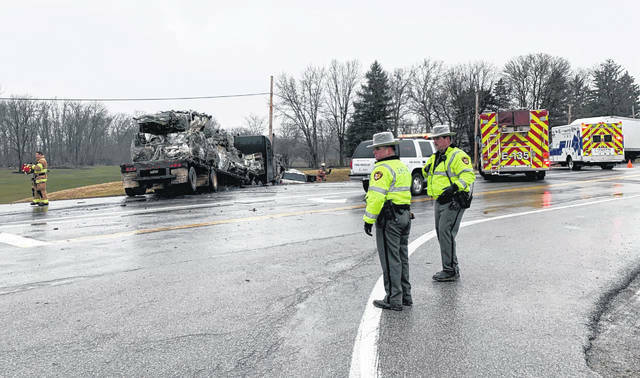 A Greenfield man was killed and two Fayette County residents were critically injured Monday afternoon in a two-vehicle accident involving a semi at the intersection of U.S. Route 62 NE and SR 753. At about 2 p.m., a 1999 Freightliner tractor-trailer was heading northbound on U.S. 62, and as it approached the intersection just north of Washington Court House, the driver — Richard Pierson, 50, of Wilmington — allegedly failed to yield at a red traffic signal, according to Fayette County Sheriff Vernon Stanforth. The semi collided with a westbound 2002 Mercury SUV driven by 40-year-old Allen Ursell, of Greenfield. The collision forced both vehicles off the roadway and into a ditch, Stanforth said. As of Monday evening, the U.S. 62 and SR 753 intersection remained partially restricted to thru-traffic as members of the Sheriff’s Traffic Crash Reconstruction Unit continued their investigation of the crash. https://www.timesgazette.com/wp-content/uploads/sites/33/2019/03/web1_received_425463838228247.jpgMany first responders were on the scene Monday at a fatal traffic crash at the U.S. Route 62/SR 753 intersection. One man was killed and two local residents were critically injured, according to Fayette County Sheriff Vernon Stanforth.